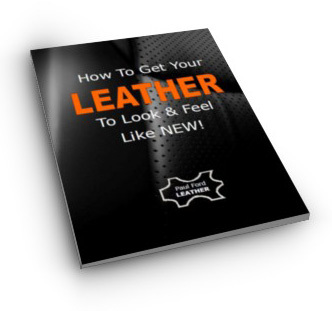 To help you understand your leather better, here's a quick guide through the tannery. Once the hides are removed from the cow, they are cured by soaking them in a salt solution. This is to stop them from deteriorating and going rotten. After this process, they are sent to the tannery. The salt solutions is washed off the skins. Then a lime solution is used to disolve hair, dung and any excess flesh. And I can tell you by experience ... the smell in this department is horrific! The hides are sorted according to the amount of defects they may have such as scarring, tick marks, barb wire marks and holes. Upholstery leather requires larger areas of unblemished hide, whereas other leather products such as shoes, saddles etc can utilise the smaller pieces. This is the reason why upholstery leather gets premium prices. Leather skins are very thick, so what the tannery does is split them into 2 and sometimes 3 layers, by passing them through machine which has a long sharp blade. Once split, the top layer, is put aside for upholstery leathers because it is the toughest and most flexible split. Whereas, the bottom layers are used for shoes and other products, and I've seen them also appearing on outside backs and arms of leather furniture! The permanently preserve the leather and improve durability, they are soaked in a rotating drum with a special chemical. This process is often termed as Chrome Tanning. Once tanned, the hides are sorted and graded according to their size, imperfections and quality. At this point, the leather is reloaded into large rotating drum, which contains dyes, oils and other chemicals to improve the strength, fastness and firmness of the hides. At this stage in the process, the leather is soaked. It is toggled and stretched onto frames and hung in a large drying room where it is dried. Many hides will have imperfections which are often filled, sanded smooth, then passed through large hot rollers to print an artificial texture or grain. If you have seen leather that has an even grain and looks a bit like vinyl, then the chances are, it has gone through this process. This type of leather is 'CORRECTED GRAIN' leather and an example is shown in the picture on the right. Now 'FULL GRAIN' leather, on the other hand, is where none of the above process has been done. This means the surface is a lot softer and will show more of the natural imperfections of the leather. Here's a picture showing an example. The hides are, what is termed, 'dry-drummed'. Which means they a loaded into a large rotating drum and tumbled for several hours. This loosens the fibres and softens the hides.. The leather is put through an automated finishing machine, which sprays on the desired colour. Normally several coats are applied. Once the colour is applied, a clear sealer is sprayed on for added durability. The lustre of this coating can be adjusted to give a high gloss, satin, or dull finish. 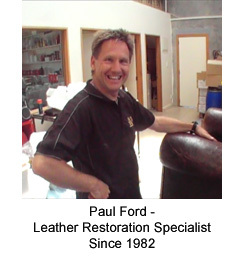 The sealer has waxes and modifiers added to give the leather its feel qualities. The leather is finally graded according to quality, colour and weight. Each hide is then put through an automated measuring machine, to measure its area. Upholstery leather measures around 4.5 to 5 sqm. Upholstery leather should be able to stand up to normal use without the finish rubbing off. The rub fastness is tested by a machine where a piece of felt is rubbed back and forth against the leather. The felt must be able to rub across the leather a certain number of times without damaging the finish. A machine flexes a piece of leather thousands of times to simulate years of wear and tear. The leather is checked for cracking and splitting. The adhesion of the finish is tested by gluing a metal plate to a piece of leather. The force that is needed to remove the plate is measured. The tear strength is tested by a machine that holds a piece of leather and pushes a metal probe into the leather. The amount of force needed to puncture the leather is measured. A piece of leather is put into a machine very similar to the one used to test rub fastness. Instead of using felt, a block with sandpaper is used. Well, this is a quick overview of how leather is processed and, if you ever get a chance to go through a tannery, you will find it to be a fascinating place. A laboratory device is used to test the ability of the leather to resist fading.